The first thing that we have to mention in this recipe is... What is the chilpachole? – since it is a very rare name. Well, this dish is originally from Veracruz and in Veracruz it is called chilpachole to a stew with chili . Although the chilpachole is more elaborated than that as it consists of a soup , which broth is prepared with chilies and more ingredients that give a strong seasoning and an intense red color to the dish. 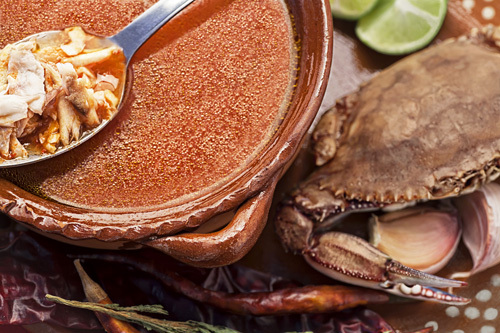 Then it is cooked with crabs that give a sensational flavor to the soup and they help to harmonize the flavors. A recipe that you cannot miss. – It is very funny but in some places in Mexico it is accustom to drink the chilpachole in “shots". Try it you will have a lot of fun! In this recipe is very laborious to cook the crabs but then everything seems easy. In the preparation we give 2 options using raw or cooked crabs. If raw crabs are used you will have to work a lot but your chilpachole will have more flavor. If cooked carb is used some flavor will be lost but the preparation is faster and simple. The chilpachole hotness comes from the arbol pepper, therefore you know what to do if you want it more spicy or less spicy. The chilpachole is seasoned with epazote and it is very important to use it because it gives an exquisite taste to the broth. Total preparation time 45 minutes . If you are going to cook this recipe with cooked crab – shred it and go to “Cook the Soup" stage. Wash 7.7 lbs of crabs with cold water, then reserve. The enough Water to cover all the crabs that were washed. The Crabs that were washed. Leave the crabs cooking in the boiling water for about 15 minutes, until they are well cooked. Heat in another saucepan over medium heat 2 tablespoons of olive oil. Pour in the saucepan the salsa that was blended and fry it for approximately 1 minute, until it acquires a more intense color; stir occasionally. Then set aside. Verify that the crabs that were left cooking are well cooked, the crabs’ carapace must have an intense red color; if not cook them for a longer time. Take from the saucepan the crabs, with the tongs and rinse them with cold water. It is very important to rinse the crabs with cold water so they stop cooking because its meat consistency can ruin if they keep on cooking. Remove from all the crabs the superior shell. Remove from the crabs the white meat, with a fork. Shred the meat that was removed from the crabs. The Crabs that were shredded. Bring the crab chilpachole to a boil over high heat. When the crab chilpachole boils reduce to low heat and cook it for about 10 minutes, until it thickens a little and it acquires a more intense color; stir occasionally. Recommendation: Enjoy this soup with tortillas or tortilla chips. Variation: The chilpachole can also be prepared with shrimp. Did you like the Chilpachole?